We have traveled all over Florida. There are many beautiful places to like but we simply love New Smyrna Beach. Whether you are riverside or oceanside, this artsy and unique community has a special feel all its own. If you enjoy beautiful, historic lodgings, look no further. The Black Dolphin Inn is everything an upscale, historic inn can and should be. 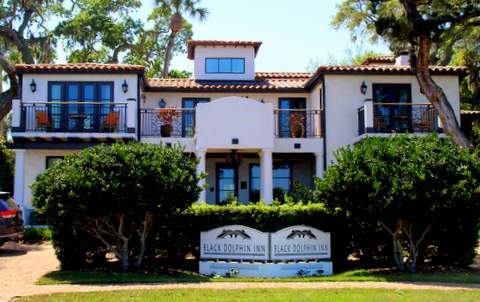 The Black Dolphin Inn is a three-story, Spanish Isle inspired historic estate with 14 guest rooms and suites with private baths, mid-century vintage furniture, custom art work, euro-style bedding, spa inspired bathrooms, and designer fabrics and soft-goods. We toured two guest rooms and stayed in the Honeymoon Suite. We found ourselves using the words "beautiful" and "wow" again and again. Our river view from the third floor balcony of the Honeymoon Suite was fantastic. It was the ideal spot to enjoy the cool breezes while sipping a glass of wine. (The Jacuzzi tub is not a bad option either). It is especially relaxing to enjoy a morning coffee on the private fishing pier / dock with deck chairs and picnic tables. We asked owner Bret Smith about the Black Dolphin Inn. What makes the look, feel, and assets of the Black Dolphin Inn unique? Inspired by the cultural and social life of our locale, we have created a boutique inn which is unique in design, amenities, and cuisine – where the space is comforting, tranquil, and alluring. We set out to create a vacation lodging product that reflects the elegance and amenities of a luxury boutique inn with the intimate comfort and service of a sophisticated bed and breakfast. We not only have to have unmatched ambiance and hit all the right style notes, but we had to make certain that our rooms would be seductive and one-of a kind with thoughtful extras and innovative twists that are unique, practical, and authentic. What do you want guests to remember about their stay here? Guests now define themselves by what they have experienced as opposed to material goods and living the life of comfort. The aspiration is more about authenticity and originality. We have focused on design, technology, and meaningful service in alignment with the enrichment of our guest lives. We are committed to building an emotional connection with our guests and firmly believe that the more our guests interact with our brand – the more inclined they are to remember it. Ultimately, it comes down to remarkable service, incredible amenities, and great value as the narrative for our guests to talk about with their friends, associates, and extended family. Could you describe your breakfast menu and vision? Executive Chef MacKenzie is bringing fresh, cutting edge, and award-winning breakfast to our guests every day. She specializes in transforming locally sourced sustainable ingredients into thoughtfully crafted cuisine. We have taken the novel approach of integrating our open-air professional grade kitchen into our Lobby area where food is the theatre and cooking is the action and the drama. Our vision was to create an exceptional dining experience within the framework of a bed and breakfast featuring quality food, beautiful kitchen design, and artfully decorated breakfast selections that you would traditionally find in a 5 star gourmet restaurant. What is special about New Smyrna Beach as a vacation destination? New Smyrna Beach is the ideal escape for travelers seeking leisurely adventures and captivating experiences and is home to more than 13 miles of pristine beaches which are ideally suited for surfing, swimming, fishing, paddle boarding and an assortment of watersport activities. New Smyrna Beach is recognized as the Redfish Capital of the World, one of the Top 20 Surf Towns in the world by National Geographic, Top 10 Beach Destinations in the United States by USA Today, America’s Top 100 Small Art Towns, and Travel and Leisure’s Magazine as one of the top 15 World’s Coolest Surf Towns. We have a large LGBT following and we are a gay, married couple ourselves. How welcoming is the Black Dolphin Inn to LGBT guests? The Black Dolphin Inn offers an ideal setting for a romantic getaway or a delightful alternative for any guest looking for a more personalized stay. It’s a vacation for the soul and senses! We treat our patrons like guests versus hotels that treat their guest like customers. We have created a sense of place that is so compelling that guests seek us out to relax, rejuvenate, and get away from the daily stresses of life. Guests view our award-winning boutique inn as an incredible arena of possibilities, like the feeling or illusion of being off the grid- anonymous and undefinable. Guests come to explore their passions for the arts, beaches, great parks, nautical surroundings, and the food scene where it is all local and authentic.